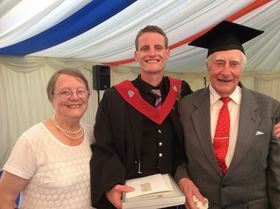 Jamie at his graduation in 2014 with his grandparents, Peter and Sheila Knight. How did it feel to win the Engineer of the Year award? Have you seen my picture? They say every picture tells a story and it's certainly true in this case. I was overwhelmed when I won and felt my hard work had been rewarded. More importantly, on a personal level, the timing was just right. My grandfather, who was also an engineer and a great inspiration for me, passed away shortly after the awards ceremony but I got the chance to show him my certificate and trophy. That was a great moment for me and I know he left us feeling very proud. Can explain a little about your career path to this point? Before I retrained as an engineer I worked as a kitchen fitter and carpenter and interestingly, being able to work with my hands gave me a great foundation for engineering and design. It also taught me that what looks good on paper isn’t always possible to build. My undergraduate study was in electromechanical engineering at Aston University in Birmingham. I graduated in 2014 with a First Class Honours and two university prizes. The first was for achieving the highest grades in that degree classification and the other was the Institution of Mechanical Engineers’ Project Award; interestingly the project was measuring pumped flow rate using LASER technology. After spending a year with Xylem as an industrial placement student in 2012, I returned after graduating from Aston as a trainee systems engineer. The decision wasn't exactly straight forward as I had two other confirmed job offers; one in power generation and the other within the aerospace industry. I chose Xylem because I already knew the team and with a degree in electromechanical engineering, you don't get a much better fit for my skills than hydraulic systems with electrical motors. Which are the career experiences that have made an impression on you so far? I really enjoyed working on the tools and I had a lot of laughs and some fun working with colleagues. However, after a while, that physical side really takes its toll on the body, especially the knees, so I felt it would be in my best interests to start making more use of the old grey matter. My father is a distinguished medical physicist and would always speak technically to me and describe mechanical and electrical systems in great detail. This probably led naturally towards engineering, although it doesn't really explain how I ended up in wastewater! What made you apply for your current position at Xylem? I applied to join Xylem at a time when the former ITT was separating its business globally into three distinct, publicly trading companies. Xylem was the new pure play water technology business which was born out of this transition. So I applied knowing that key product brands, including Flygt, would form part of the wastewater picture, which gave me defined reassurances, especially knowing the importance that is placed on R&D for Flygt products. Pump application in general has also interested me from my early fluid dynamic days. In particular, I'm interested in centrifugal machinery and the way in which performance reacts to system variables; the ability to mathematically predict this behaviour is an added bonus. Can you explain more about your work at Xylem and what your role involves? As Systems Engineers at Xylem we deal with the most technically challenging pump application and station design projects involving Flygt products. My expertise is generally with the axial flow and centrifugal submersible machinery and more specifically high cost large pumps. We'll look at anything water industry orientated from non-Newtonian fluid flow at high temperature to exceptionally long rising mains and large varying static head conditions. Energy analysis and life-cycle costing also form part of the job description and this was a good lead into becoming a Certified Pump System Auditor with the British Pump Manufacturers' Association (BPMA). This also gets me out and about testing pump performance and writing reports for clients to improve pump station efficiency and save money. I really enjoy that kind of hands-on work and it makes practical use of my technical skills. What's special about Xylem in the context of the work you do? Xylem is a global community. It doesn't matter whether you're from Malaysia or South Carolina, if you're part of that community and the topic you're interested in is connected with water or you've got a problem that needs solving, there's always someone to talk to and help you out if you need it. Two of my colleagues made this observation earlier this year at our annual training weeks in Sweden. Whilst out in the evening, I was sitting with a Danish colleague for over an hour, drawing and assessing system and pump curves with nothing more than a piece of paper and a pen. What's great about this interaction is that language didn't form a barrier, it wasn't even needed; we were talking pump application so we both understood each other. Xylem has a collaborative approach to business. As a commercial team, if we need to know something from R&D, we just pick up the phone. The Xylem UK team works very well together; we all have our own areas of expertise and specialities. Our delivery is all engineered-solution focused and we get rewarded for this when we provide a great solution or technical advice. I also get to work with some of the leading industry experts on application and design; so this is also good for my career development moving forwards. Can you tell us about your role as a member of the BIM4Water steering group? I sit on the group as an elected member from the supply chain. I feel it is important to have a pump manufacturer within this group as pumps form such a large proportion of water industry assets. My current focus is on product data and how this interacts with the common data environment through project delivery and into asset management. I personally feel there are some true benefits to all of us by securely capturing and storing information; it not only allows us to specify a machine without confusion but it allows us to efficiently replace and repair it when it fails. This saves money, and that's what engineers do best. Why is it important to you, both personally and professionally, to be part of BIM4Water? I think we all accept processes are becoming smarter and more efficient through digitization and collaboration; part of all this may be attributed to the whole industry 4.0 movement and the true benefits of BIM for the water industry seem to be slotting into this larger picture. Being a part of BIM4Water and helping facilitate the benefits is a fascinating learning journey. Whether I'm directly contributing towards or just observing the varying success stories from customers and colleagues within the industry as they move towards better information management, overall the commitment is important and rewarding. We should all be doing more to support better project delivery and, more importantly, enhanced facility and asset management; ultimately providing better customer service. In terms of emerging technologies, what kind of projects are you involved with? Flygt is one of Xylem's brands, which has a long-standing interest in additive manufacturing. I believe we were one of the first companies to acquire a 3D printer for enhanced casting processes. The technology has moved along now and we are seeing direct manufacturing becoming more readily available, so we can now look at the possibility of removing the need for casting altogether. Some of my work in this field has been facilitating meetings with other industries including aerospace, automotive and nuclear to look at some of the most advanced techniques that they are using and see how these could be used in pump manufacture, research and design. Some of my more practical projects include 3D printing within the hydraulic modelling of pumps and creating display models for awareness and training. How do you see your own professional future? I feel the future offers great opportunities for professional engineers. There is growing demand for energy conservation, leaner processes and machine performance diagnosis. Going forward it will be engineers that will be stoking the engine and making sure this will happen. My long term goals are to remain with Xylem and see where the journey takes me. What do you see as the main trends within the industry and what issues should the industry be addressing? The need to transfer energy to fluids using pumps will be required for a very long time; this is absolute fact. Our challenge is to make this transfer more efficient with less performance degradation and machine breakdown. As with the automotive industry over the past 50 years, I envisage huge change for pumps and their associated systems; especially in the municipal wastewater sector. Generally, engineering systems are becoming ever more advanced, intelligent and self-reliant. I think very soon this technology will flood the pump industry and see manufacturers moving towards smarter systems with more embedded intelligence. In the near future I believe pumps will be automatically monitoring and logging their own performance; this information will determine optimum service and repair intervals which will improve the operational cost and life expectancy of the asset. This movement is already happening and a great example of this is the Flygt Concertor. This machine is a first of its kind and can bring many benefits to wastewater pumping. In my mind it's a bit like the classic 80s robot, called “Johnny5”, the ability to monitor your own behaviour and detect breakdown and blockage. These adaptable machines will replace large stocks of product variations and designs, leaving a single off-the-shelf solution. This will not only free up storage space and improve lead-times but the embedded technology will also allow cleaner more efficient wastewater pumping, something the marketplace has always been looking for. In summary, the future for pumps is integrated intelligence, enhanced monitoring and control and greater longevity.